Named after George Smith, Glenlivet's founder, this has the smooth, fruity flavours of the house, complemented by the use of first-fill American oak casks. The lack of age-statement allows the distiller to draw from casks with a range of ages. Flavours of toffee apple and orange. 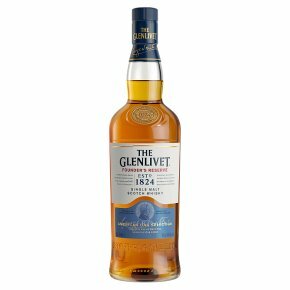 The Glenlivet Founder's Reserve is an award winning single malt scotch whisky. It captures the distinct, smooth, fruity taste that its founder first envisioned. It's a classic single malt style of whisky but with an innovative contemporary fresh taste. It starts with a skillful selection of casks that enhances the signature fruity flavours of The Glenlivet. The traditional oak casks are complemented by selective use of American first-fill casks to give a hint of creamy sweetness - creating an exceptionally well-balanced and smooth malt. Sold with its signature blue gift box, making this the perfect whisky to celebrate a special occasion. Serving suggestion: Drink to your own preference, straight up or with a drop of water to open the creamy and intensely smooth character. When serving with ice, large cubes are recommended to allow slow dilution releasing the creamy, sweet characters.